Want to boost the flavor of macaroni and cheese? 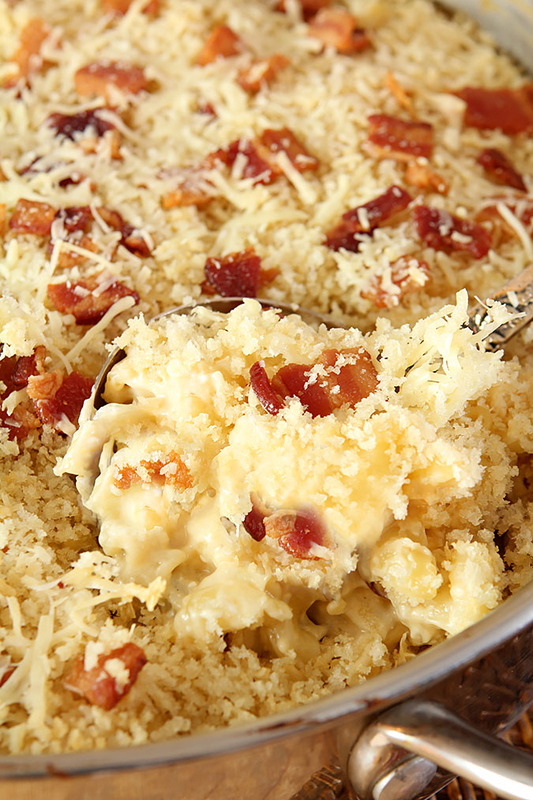 Try this Smoked Gouda Macaroni and Cheese with Bacon; it’s perfect! I’ve recently joined a group run by the Food Network that publishes a weekly list of dishes from favorite bloggers that wrap around a theme. Actually I’ve been a part of the group but took a long sabbatical during the past 18 months. Feeling a bit less overwhelmed and ready to get back in the groove so I’m going to start posting with them again. This week I’ve been given a pass because it’s all about the mac and cheese and I just made this dish for Thanksgiving and it’s so fabulous I thought it would be great to share with a larger audience. We just loved it! Smoked Gouda is a wonderful cheese and was perfect in this Smoked Gouda Macaroni and Cheese with Bacon! I’m like everyone else when it comes to Thanksgiving dishes; there is something about the dishes we’ve grown up with that seem so appropriate on this day when we give thanks. For the abundance of friends, family and of course, food at the table. For my small family there has always been a Maple and Bacon roasted turkey with cornbread stuffing (amazing with that maple flavored gravy), jalapeno sweet potatoes, a very non traditional except for us mushroom dish, and a new cranberry sauce every year. Then there is that need to do something different so every year, while staying in the vein of foods that seem appropriate for a traditional holiday, I try my hand at something we haven’t had before. I probably do that with dessert too…but we’re not there yet! This year that dish is a Smoked Gouda Macaroni and Cheese with Bacon. I have to admit, for many years when I was a single mom the only macaroni and cheese that showed up at our table was from a blue box. My kids loved that stuff and I could tolerate it so it was a pantry staple. Years ago I started making more of the ‘real deal’ type of macaroni and cheese combinations and I’m hooked. I don’t do it often and the ingredient list clearly shows why…butter, cream, cream cheese? All so good but not so often. Thanksgiving is the perfect time to indulge and this years offering was inspired by one thing. That package of Smoked Gouda cheese I bought at Sprouts last week. I didn’t have plans for it then but it sure fit perfectly into the plan I devised. Some sauteed onions, a bit of bacon and a whole bunch of cheese. I prefer cooking my macaroni and cheese on the stove-top and just browning the dish under the broiler after adding the crumb topping. I like the gooey results so much more than baked. But you can bake it if you want; let me know how that turns out if you do. I had every intention of freezing this for several meals this winter. Granted it lasted for several meals but none from the freezer. I would have a serving each day and say, ‘Tomorrow I’ll freeze the rest.’ Sure, right. It’s gone. I suppose that is a good testimony but even better I think was my friends young son who is such a picky eater. He was here with his mom the other day as I was cleaning up and I asked him if he would like to try a bit and he did that thing picky eaters do; you know, just sort of automatically snubbed his nose at it. I asked him if he liked Kraft Macaroni and Cheese and he said he did. So I got him a small plate, put a fork on it and just said he could try it if he wanted to. It took a bit I won’t deny before that fork ventured with a small bite to his tongue but it did and lo and behold, the boy went nuts. I don’t suppose any of us who love to cook could ask for more but he did. He even whispered to mom who shared with me. ‘Do you think we could take some home with us?’ Music to my ‘I love to feed the world’ ears! It’s rich and warm and just redolent of this time of year when we want to nurture those we love with good food and good times. This one works for the food part; the rest is up to you! As a side note now that the holiday season is over; this would also be perfect for the Food Bowl. You know that football game when it’s really all about the food? Do it! 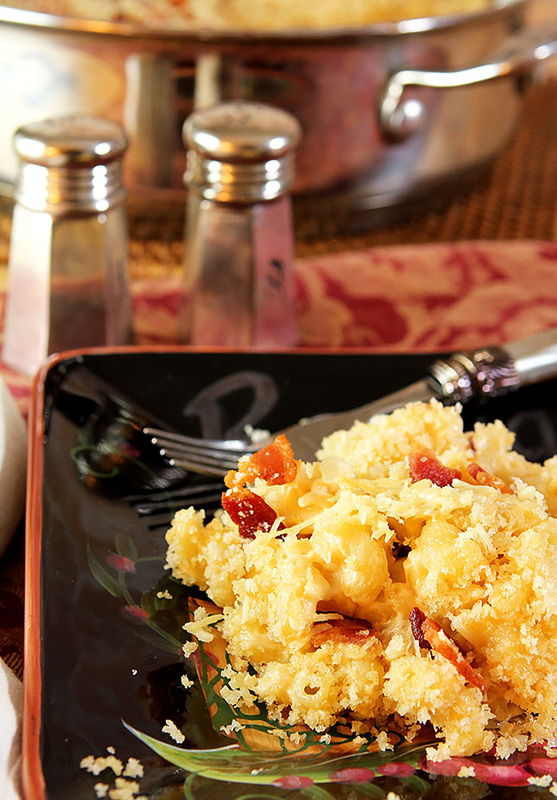 Rich and flavorful with smoked Gouda, caramelized onions and bacon, this macaroni and cheese is cooked on the stove-top and finished with a flavorful bread crumb topping. In large oven safe pan, melt butter over medium high heat. Saute chopped onions until translucent and just starting to brown..
Reduce heat to medium and sprinkle in flour; whisking until mixed with butter and onion. Cook on medium heat for one minute. Combine milk, cream and broth in a large measuring cup and add all at one time to mixture in pan. Whisk over medium heat for 1-2 minutes. Mixture will thicken considerably. Add salt, pepper, mustard and Worcestershire sauce; reduce heat to low and continue to cook for 2-3 minutes. Add the cheeses to the pan and stir to thoroughly combine. Add cooked macaroni to cheese mixture and stir to combine; reduce heat and cook on low for 5 minutes for everything to meld together and get hot. Smooth top. 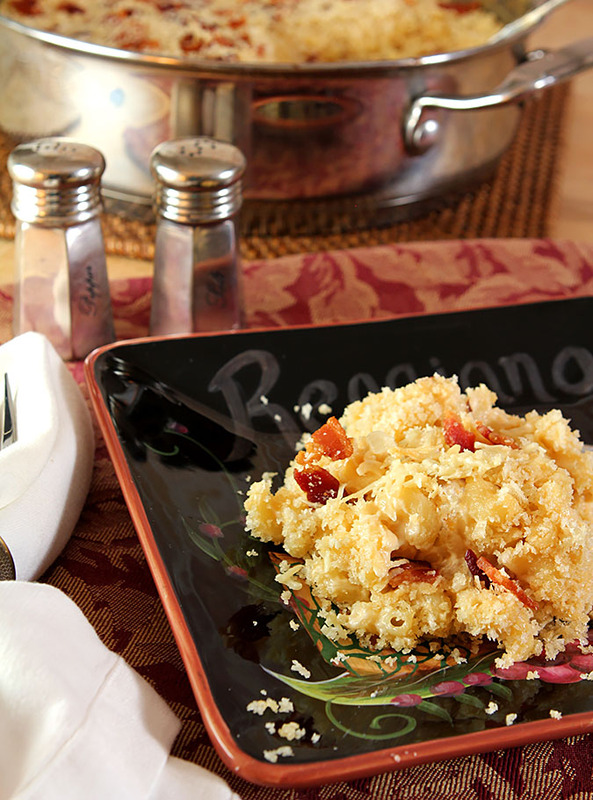 Combine panko bread crumbs, melted butter, bacon and Parmesan cheese together and mix well. Sprinkle over the top of the noodle casserole and broil the dish until the top is just starting to brown. NOTE: You can prepare ahead of time; reserving the topping. Heat on the stovetop, cover with the topping and broil immediately before serving. Join myself and other bloggers as we celebrate Comfort Foods this season! This mac&cheese is ridiculously amazing!!! My girlfriends & I had a wine&expos pairing night & this was paired with an un-oaked Chardonnay & it was by far the best dish we had! THANK YOU FOR THIS!! I’m wanting to double this recipe for a large crowd (20people+)…would I simply just double each ingredient?? YAY! I just love it when someone shares my love for a dish; thanks so much for taking the time to let me know! made this dish tonight and it was awesome! One thing I did different was to leave about half of the bacon in the cheese sauce. So glad you enjoyed it Carla…and a great change I might have to try! Pretty much what I did for several days in a row and then was still sad when it was gone! Thank you Cindy! I’ve sort of fallen in love with Smoked Gouda and it was just perfect. I guess I just like Gouda huh? Thanks so much; I’ll get over and revise that pronto! This looks like everything I want in a dish on a cold day– warm, cozy, cheesy and with bacon on top. I can see why this never made it into the freezer! This sounds wonderful. Cory loves smoked gouda and I think I will surprise this for him on his birthday next week. Stumbled and Pinned. Have a great week!